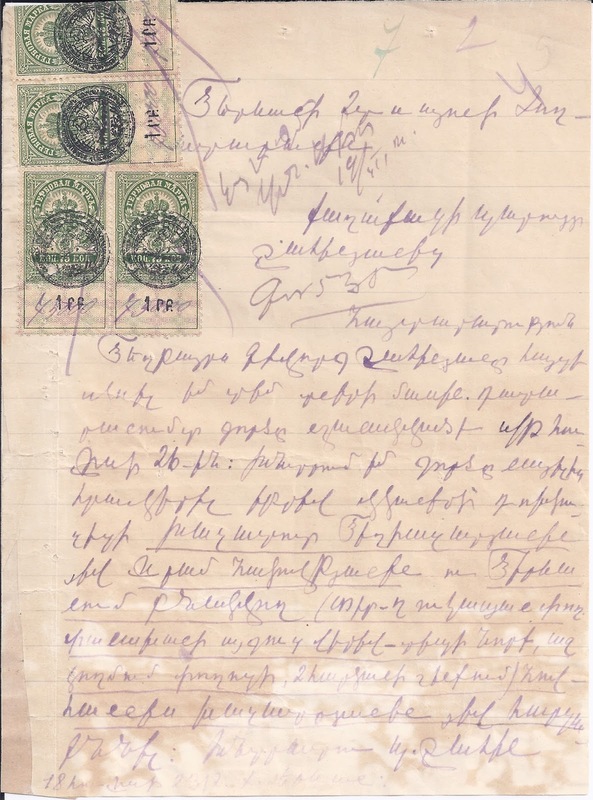 The fiscal stamps on this little document have been Armenianised three times over. First, the Imperial Russian 75 kopeck General Fiscal stamps were perforated in Cyrillic with the initials " E.K.P" standing for the Yerevan Chancellery (or Exchequer) Court. Zakiyan in his 2003 book dates these Perfins to September 1919, so quite early in the Dashnak Armenian period. On the 75 kopeck, the Perfin is listed as #8. Then the Dashnak fiscals were Sovietised with a lithographic overprint comprising a Coat of Arms (over the Imperial Arms) and a new "1 rf" value in Armenian script. This would be Zakiyan's # 16 but for the fact that the stamp has the E.K.P perfin - Zakiyan does not list the overprint on this stamp, though it makes sense as a way of using up old Dashnak stamps. 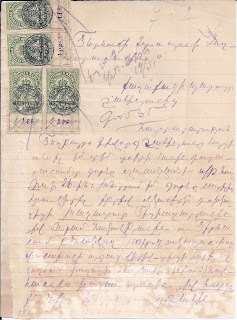 Zakiyan dates the lithographic overprints to September 1922. My document appears to date from July 1923 with date endorsements at top centre and in the very bottom line.